When you buy this product you earn 26 Reward points. 1. Why is cleansing important? Sebum and dirt build up throughout the day. By cleansing you will prevent your skin from becoming dull and spots from developing. 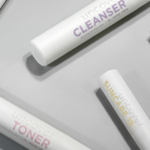 A good Cleanser ensures, furthermore, that the active substances in your other skincare products, such as the Toner and/or Moisturizer, are more effectively absorbed. 2. How do I remove the Cleanser? The Cleanser is water soluble. So, after cleansing, you can rinse it off with warm water. If you only use a cotton pad to remove the Cleanser, some of the product may be left behind on the skin. 3. Can I remove my make-up with the Cleanser? The Cleanser is really meant to clean your skin, not to remove make-up. If you want to get rid of all left over make-up, it is better to use a separate remover. After that you can apply the Cleanser onto your face. 4. How often should I use the Cleanser? Use the Cleanser in the morning and in the evening. If your skin is very dry or sensitive though, use the Cleanser just once a day; preferably in the evening. In the morning you can wash your face with warm water and then apply the Toner. 5. Why does the Cleanser not foam? A product doesn’t need to foam to be able to clean effectively. In fact it is better not to. Foaming products usually contain ingredients which irritate and dehydrate the skin.